All new for the 2019 model year, the Subaru Ascent is the largest vehicle Subaru has ever offered. With seating for up to eight passengers and over 17 cubic feet of cargo space behind the third row, the Ascent is signifanctly larger than the ill-fated Subaru Tribeca which was discontinued in 2014. 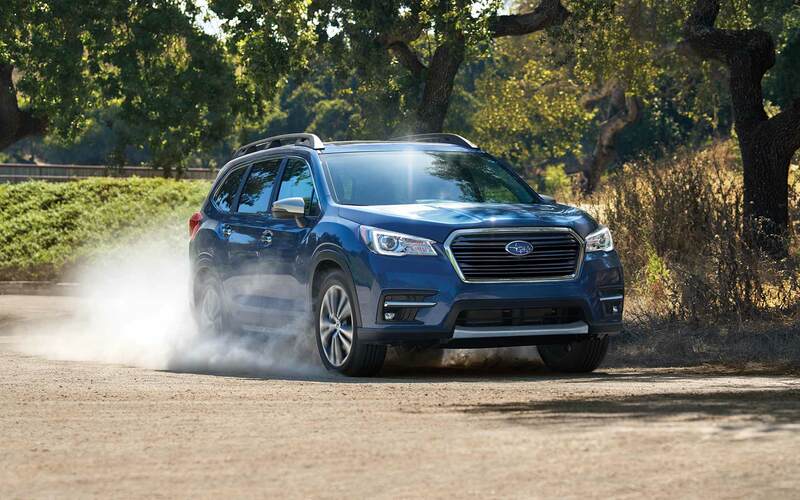 Sophisticated styling coupled with a high-powered engine and Subaru's notorious symmetrical all-wheel drive makes the Ascent a force to reckon with in the midsize SUV market. It is also the first model to include EyeSight® Drive Assist Technology on every trim level, which monitors the movement of other vehicles, optimizes cruise controls and alerts the driver of lane departure. Subaru is known for their high safety standards and the Ascent is no exception. The base trim level Ascent gives budget-conscious drivers more for their money. It includes raised roof rails, three-zone climate control, SUBARU STARLINK™ 6.5-inch Multimedia, and SirusXM® Radio. The base model seats eight thanks to the second-row bench seat, and you can be sure all eight passengers have somewhere to store their drinks with 19 cup and bottle holders throughout the interior. Available in four classic exterior colors and black cloth interior, the base Ascent model offers enough variety to stand out in the crowd. The powerful 260-hp SUBARU BOXER® engine along with Subaru's X-MODE® with Hill Descent Control gives you an SUV that will take you anywhere you need to go. The base model Ascent is definitely no slacker when it comes to features and power without breaking the bank. If you're needing an SUV with towing capabilities, you'll want to look into the Ascent Premium. With a 5000-lb towing capacity, the Ascent pulls at the top end of the midsize SUV class. Available in eight exterior colors and either black or ivory cloth interior, the Premium model also boasts some elegant touches like body-colored mirrors, chrome exhaust tips, leather-wrapped shift handle and steering wheel, and 18-inch alloy wheels in a gray finish. If you're after the most optimal temperature management, the Ascent Premium includes rear-seat climate control, heated exterior mirrors, heated front seats, and windshield wiper de-icer. You will also find tech features such as automatic collision notification, concierge services, blind spot detection, rear cross-traffic alert, and remote engine start on the Premium trim level. Finally, the option is yours whether you'd like the second-row bench or captain's chairs for an eight- or seven-passenger capacity, respectively. The Ascent Premium includes many of the bells and whistles that you'd find in luxury SUVs at only one trim level up from the base model. The Ascent Limited is the second to highest of the Ascent trim levels. It includes leather-trimmed upholstery available in either black or ivory, LED fog lights, LED Steering Responsive Headlights (SRH), 20-inch dark gray alloy wheels, and eight exterior color choices. When it comes to interior comfort, the Limited won't disappoint with a 10-way power-adjustable driver's seat with thigh support, headed front and second-row seats, retractable sunshades in the second row, and a heated steering wheel. For those cold mornings, the keyless access with push-button start will really come in handy. A power-rear gate, 8.0-inch multimedia display, reverse automatic braking, and 6 USB ports throughout the interior pull together the Ascent Limited into a refined, but functional package suitable for any driver. If you're in the market for the best Subaru has to offer, you're going to want to check out the Ascent Touring. This top-of-the-line model comes with a breathtaking panoramic moonroof, satin silver side mirrors, and chrome door handles standard. The Touring is available in six exterior colors with Subaru's premium Java Brown leather interior and woodgrain accents throughout making the inside look as classy as the exterior. The Ascent Touring comes exclusively with second-row captain's chairs so if you're in need of the full eight-passenger capacity, you'll need to step down to the Limited model or below. This top-tier model comes loaded with Harmon Kardon® premium audio with 14 speakers, rain-sensing wipers, heated and ventilated front seats, leather steering wheel, 120V power outlet, and a stowable tonneau cover. When it comes to finest finishes and most exciting features, the Ascent Touring delivers. If you're ready to learn more about the 2019 Subaru Ascent, visit us today at Flatirons Subaru in Boulder Colorado. We've been family-owned for over 50 years so you know you're going to be treated just like a member of the family when you come in. We are serving Denver Broomfield Boulder areas so even if you're outside our location in Boulder Colorado, we'll make it worth your trip.